Lancashire Wildlife Blogs – Collecting together in one place the information about Lancashire wildlife published on blogs. To help people discover, enjoy and protect our local natural history. Please note the content of any blog post on this site is the property of the specific blog publisher and not this website. The visiting drake green-winged teal moved on but was miraculously replaced by yet another Nearctic duck; American wigeon. This fine male turned up on the Eric Morecambe Pools and was easy to pick out from the small group of Eurasian wigeon with which it was keeping company. Also on the saltmarsh pools, we have continued to see the mass of black-tailed godwits moult into their resplendent breeding garb. Amongst them, a handful of bar-tailed godwits, a few knots and the occasional spotted redshank have been seen. Our booming bittern can still be heard mainly in the very early hours, but he also reminds of us his presence now again in the afternoon pleasing any visitors within earshot. The marsh harriers are busy nesting – we have at least four active pairs at the moment. Our ever-popular otters have been stealing the limelight with frequent appearances in the deeper Causeway and Lower pools. Recent sightings of ospreys include birds catching fish in front of hides full of admirers; we should see daily visits from the Foulshaw pair as well as lingering non-breeders and others passing through so always keep your eyes to the skies! Here at Leighton Moss, as on other major RSPB reserves, we are committed to engaging with the next generation and doing all that we can to connect young people to nature. Here, Learning and Visitor Assistant, Jayne Buchanan, explains how we’re helping to inspire the conservationist of tomorrow. “In January 2019 the Department for Education launched the ‘My Activity Passport’ for primary school children in England. The passport contains a list of activities that intend to support schools and parents in introducing children to a wide variety of experiences. The RSPB believes that connecting with nature should be part of every child’s life and many nature based experiences are embedded within the new passport. 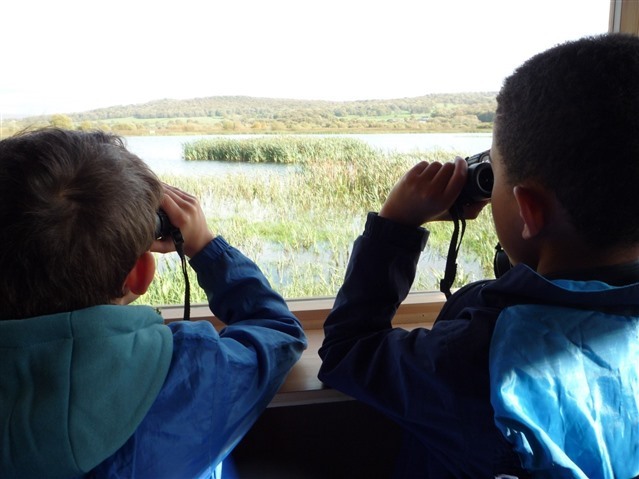 A visit to a nature reserve such as Leighton Moss either as part of a school visit or with family members would enable children to tick off a large number of activities such as ‘Discover what is in a pond’, ‘Become a nature detective’ or ‘Go birdwatching’. Use of the Activity Passport can also be linked with the RSPB Wild Challenge, converting ticks on the passport into Wild Challenge bronze, silver and gold awards by uploading evidence of nature experiences to the Wild Challenge website. Taking part in such activities will hopefully make a start in addressing our children’s increasing disconnection from nature. A study carried out in 2013 by the RSPB and the University of Essex found that only 21% of children in England had a connection to nature. Growing up in the 1970’s I was amongst the 40% of children who regularly played outside in nature. In 2009 according to Natural England only 10% of children played outside in natural environments. We are all aware that as a society we are surrounded and at times overwhelmed by a tidal wave of technology. Simple natural pleasures such as jumping in puddles on a rainy day, picking juicy blackberries or lying on the grass making daisy chains have been replaced by virtual multimedia experiences for many children. It is not just the convenience and availability of technology that has fuelled the disconnect but children are growing up in an increasingly risk adverse society where supervised play in parks and gardens is more likely to be children’s experience of outdoor play. Leighton Moss and Morecambe Bay Nature Reserve with its abundance of spectacular wildlife, variety of habitats and good visitor infrastructure gives schools and families the opportunities to introduce children to nature in a multitude of ways. Last year the learning team welcomed over 2,900 young people to the reserve, connecting them with nature through programmes such as Discovering Birds, Plant Detectives and Investigating Minibeasts. Most of the children we engaged with had never visited a nature reserve, bird watched from a hide or met a woodlouse up close! A visit is a chance for every child (and accompanying adults) in the group to learn and make their own connections with nature and we aim to make the time the children spend here at Leighton Moss an experience that they want to share with others and one that they will remember for a long time. It is fantastic when children who have been on a school visit bring their families back to the reserve, with the implementation of the Activity Passport there will hopefully be even more reasons for parents to share nature experiences with their children. The future of nature conservation is dependent on young people feeling a connection with nature, including nature activities in a national initiative for primary aged children can only help shape a generation’s attitudes”.